A little while ago, in the process of preparing for a radio interview about my book, I was looking at the outline the radio network wanted me to follow when we discussed it on air. What I found particularly interesting about the outline was that it forced me to think again about why I had written the book in the first place — what I wanted readers to take away from it, and what I hoped to achieve from it. It reminded me of something I didn’t do enough of as a business owner, and wish I had. That is, taking the time, on a regular basis, to ask myself why I’d wanted to own my own business, what I expected to achieve from it, how large I wanted the business to be, how much profit I’d hoped to make, and several other questions. It may seem like asking questions like these once a business is up and running is a waste of time, but the fact is that, if you look at business owners today, it’s painfully obvious that many of them have lost track of their original dream. They do own their own businesses, but what they own is not what they dreamed it would be. The reason so many owners find themselves in this position is that they’re so busy doing what they do that they lose their focus. The daily, monthly, quarterly grind just wears you down. Every owner, though, started with a goal, a reason for wanting to open a business. And if you lose track of that goal it’s not unlikely you will find yourself with a company — even a successful one — that doesn’t provide you with what you wanted to achieve. It’s been my experience that the only way to keep this from happening is by doing a “check-up from the neck up,” as one of my mentors used to say, on a regular basis. As a business owner, success is yours to define, both for the business and for yourself. 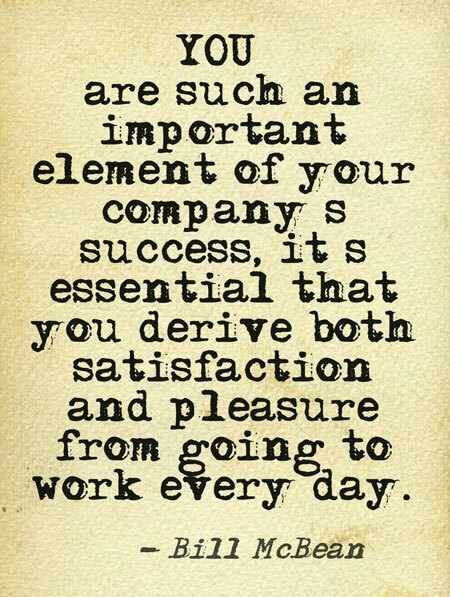 It’s one thing to have a successful business and quite another to personally enjoy the ride. By asking yourself this question you can determine if you’re not enjoying what you’re doing, and if so, take whatever corrective action is necessary to resolve the problem. As an owner, you should be running the business rather than having the business run you. And as you’ve probably already learned, it’s easy to let the business take over your life. But if that’s happened, something will have to change, because if it doesn’t neither you nor whatever pleasure you get from managing the business will last. One of the ways we all measure success, and happiness, is by how much money we make. So if your answer to this question is “No,” you have to determine if your market, and your talent, are capable of delivering that kind of financial success. Dealing with this reality has to be one of your main focuses, because when it’s all said and done reality always wins. As I discuss in The Facts of Business Life, every company has a life cycle that takes it through five levels: “Ownership and Opportunity,” “Creating Your Company’s DNA,” “From Survival to Success,” “Maintaining Success,” and, finally, “Moving On When it’s Time to Go.” Knowing where your business is in its life cycle enables you to determine not only how much you’ve achieved toward your goal but, even more important, how to get from where you are to where you want to be. It’s never too early for a successful owner to start thinking about an exit strategy. And since the overall goal of every owner is to get out of the business healthy, wealthy, and satisfied, so they can enjoy the future, asking yourself this question will remind you of what you have to do to make sure that happens. The bottom line is that owners do what they do for independence, financial rewards, and the thrill of creating success. And if you stop every once in a while to do a check-up and ask yourself if that’s what your business is providing you, you’re much more likely to achieve it. Bill McBean, author of The Facts of Business Life: What Every Successful Business Owner Knows that You Dont , spent many of his nearly forty years as a successful business owner in the automobile industry where, among many other achievements, he purchased several underperforming dealerships and turned them into a successful business enterprise with yearly sales of more than $160 million. Since selling the company to the world’s largest automotive retailer, AutoNation, McBean has been involved in several new businesses, including McBean Partners, an investment and business mentoring company, and Net Claims Now, which provides administrative services and support to the restoration industry. One business basic is to take the the time, on a regular basis, to ask yourself why you wanted to own your business, what you expected to achieve from it, how large you wanted the business to be, and several other questions.